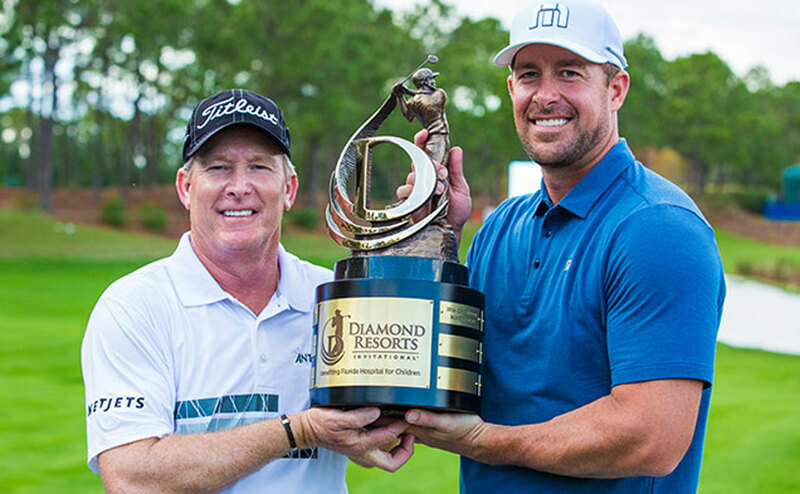 While Woody Austin and Mark Mulder raised the trophies as the professional and celebrity victors at the recent Diamond Resorts Invitational™, the biggest winner was the tournament’s main beneficiary, Florida Hospital for Children, receiving $585,000 in contributions. The accompanying live and silent auctions have now raised more than $2.3 million for Florida Hospital for Children the past four years. The Diamond Resorts Invitational™ was televised live on Golf Channel from Friday, Jan. 13 through Sunday, Jan. 15, and featured a ground breaking format with 27 PGA TOUR Champions, four LPGA stars and 48 sports and entertainment celebrities. The historic event marked the first time multiple LPGA players have competed individually against the PGA Tour Champions in a PGA TOUR-sanctioned event. Players competed from the same tees over 54 holes in a Modified Stableford scoring format for separate purses in professional and celebrity categories of $750,000 and $500,000, respectively. The popularity of the singular format with golf fans was obvious with attendance at Tranquilo Golf Club at Four Seasons Resort in Orlando, and weekend long television ratings, exceeding all expectations. Along with winner Woody Austin, who opened the tournament shooting 59 — one of eight players in history to record that score during a tournament, were PGA TOUR Champions John Daly, Colin Montgomerie, Ian Woosnam, Kenny Perry, Mark Calcavecchia, John Cook, Lee Janzen, Scott Hoch, Jeff Sluman, Tommy Armour III, Gil Morgan and Billy Mayfair among the age 50+ professionals. LPGA Tour players included Lexi Thompson, Brittany Lincicome, Brittany Lang and Brooke Henderson. The celebrity field was led by Marcus Allen, Roger Clemens, Josh Donaldson, Chicago Cubs World Champion pitchers Jon Lester and John Lackey, Colt Ford, Tom Glavine, Greg Maddux, Brian McCann, Kevin Millar, Mike Modano, Mark Mulder, Blair O’Neal, Jake Owen, Chad Pfeifer, Alfonso Ribeiro, Jeremy Roenick, Mark Rypien, John Smoltz, Cole Swindell, Brian Urlacher, Justin Verlander, Larry the Cable Guy and 2016 celebrity champion Mardy Fish. Active National Football League stars included Arizona Cardinals All-Pros Larry Fitzgerald and Patrick Peterson, as well as the Jacksonville Jaguars Bryan Walters. The Diamond Resorts Invitational™ was the final PGA TOUR Champions sanctioned “Challenge Season” event before the Tour’s Regular Season opening event in Hawaii. For more information on the Diamond Resorts Invitational™, please visit www.DiamondResortsInvitational.com.